Article first published as Book Review: ‘These Thy Gifts’ by Vincent Panettiere on Blogcritics. 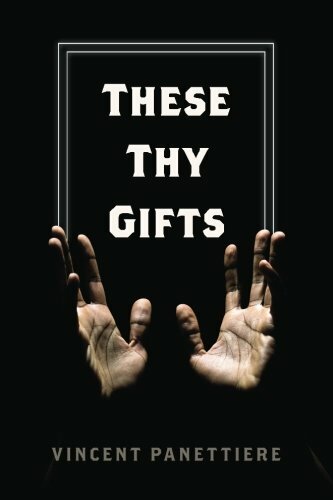 Being familiar with the author’s work, I quickly jumped at the opportunity to review “These Thy Gifts” by Vincent Panettiere. The story follows Steve Tromboli, a catholic priest, in his journey through faith, history, and his own human impulses within the context of the environments around him throughout his life. The story not only visits concepts within the Priesthood of the Catholic Church, such as chastity, hierarchy, scandal, and corruption; it also presents the reader with how a young priest deals with his own doubts, human needs, relationships, and sins, while trying to live out his vocation and serve his parishioners. Through Tromboli’s life, readers will experience fifty years of history. Readers will also visit the Italian-American community and its colorful characters, and live the impossible romance of his forbidden love Rosalie, who married low-level mobster, Tony Lamarca. Panettiere’s writing is spot on with character development, descriptions, writing style, and research. However, one noteworthy issue would be about story editing, as it moved somewhat slowly at times. This might be due to some scenes and details that did not move the story along, and could have been flushed out to help the pace. Even so, the story was so captivating it did not affect my enjoyment of the book. Overall, “These Thy Gifts” by Vincent Panettiere is a captivating, and revealing journey through history, faith, and a man’s lifetime dedication to serving his vocation. I truly enjoyed this read, and found it to be interesting, thought provoking, fun, and entertaining. Definitely recommended reading!